I was checking and I bought 3 chips on ebay in late 2016. The price almost tripled since then. Bought one about 1 year ago. The pins had some oxidation on them, but it was easily removable with a glass brush. It would be great and helpful if the names of the Chinese vendors from Ebay that sold genuine V9958/38 chips were made known to members here. 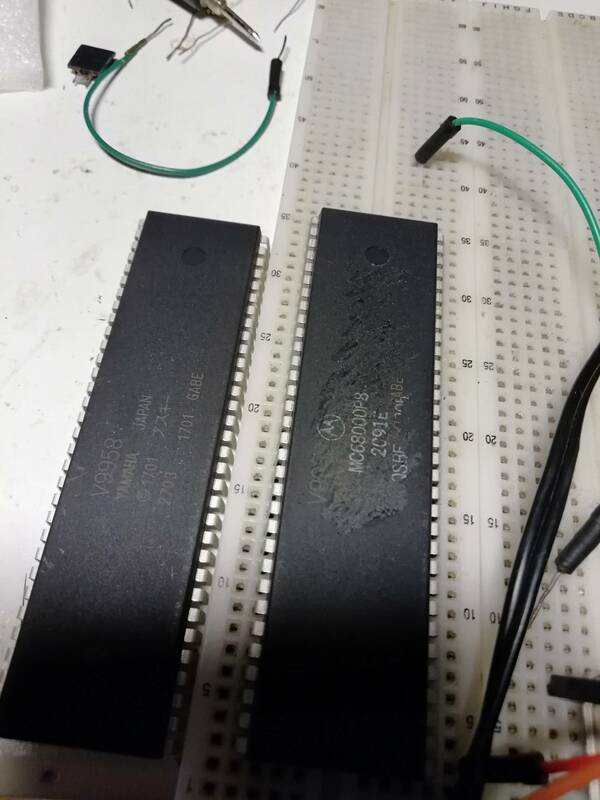 I didn't notice the wider DIP64 package and bought them but when I got around to using them I noticed they where just painted as V9958, if you scratch the top they are revealed to be just M680000P8 CPUs and maybe dead ones from a very quick test I did. To me that doesn't look obviously fake, I can easily see me buying one (if I needed a DPU). Surely you've reported the seller to eBay? I've not reported the seller yet and i feel a bit bad for asking him a refund because i don't think he was aware that they are fake, he just sourced them from somebody else without testing them. But i also i bought 6 41464 drams and only recieved two.. i don't know..
Wow, first time i see fake V9958's... I guess nothing's safe from scumbag sellers. Comparing the photo to the real thing, the most obvious difference is that the real V9958 doesn't have a notch in the middle of one side, but instead has a bigger indented circle in one corner to denote the direction. You should report the seller, if anything so that other people don't make the mistake of buying them.